Born in 1911 in Beverly, Massachusetts, Barnet knew by the age of ten that he wanted to be an artist. As a student, he studied with Philip Leslie Hale at the School of the Museum of Fine Arts, Boston and viewed first-hand John Singer Sargent at work on the murals of the Boston Public Library. In 1930, Barnet studied at the Art Students League of New York, with Stuart Davis and Charles Locke, beginning his long association with the school. Here he concentrated on painting as well as printmaking, and, in 1936, he became the official printer for the Art Students League. There, he later instructed students in the graphic arts at the school and taught alongside the likes of Yasuo Kuniyoshi, Robert Beverly Hale and Richard Pousette-Dart. Barnet influenced a generation of artists, including James Rosenquist, Knox Martin, Emil Milan, Paul Jenkins and Cy Twombly. Barnet continued his love of teaching with positions at the Cooper Union, at Yale University, and at the Pennsylvania Academy of Fine Arts. He had three sons, Peter, Richard, and Todd Barnet, by his first wife Mary Sinclair. Barnet later married Elena Barnet, with whom he had a daughter, Ona Barnet. Barnett's works span the various "movements" of their era, from his early social realist work to his final signature style of clean lines and carefully placed volumes of solid color in a kind of minimalist representational approach. His work is concerned with humanity, yet at his core he always remained a formalist, cerebral in his approach to the elements that make up a good picture. In his interviews he articulated his well thought out principles regarding color use, composition and subject matter, in a professorial manner reflecting the theoretical acumen he brought to his teaching. Like many American painters of his generation he was digesting the evolving trends in Europe and integrating the new visual vocabulary into his American style while remaining universal, referencing his own personal history with images of his wife, his daughter, and their family pets. As James Thomas Flexner wrote, Barnet’s work “makes us experience the interplay between the personal and the universal.” While remaining representational, the simple elegance of the figures and their flat surfaces reflect his exploration with abstraction. Will's artistic output spans eighty years. Few artists, other than Picasso or Monet, can claim such a long continuous period of inspired art making, nor the logical progression of moving through artistic phases: in the 1930s he was a social realist, in the 1940s a Modernist, in the 1950s an Abstract Expressionist and in the 1960s and onward he settled on a representational minimalism honed from the refinement of his earlier explorations. His early work is decidedly social realist, with sullen portraits done in dark tonalities that suggest both the struggle of the depression era and the hope in the simple love of family life. He moves out of this phase with the improving economy and in the 1940s adds vibrant color and more abstract figures, suggesting a lifting of the depression era malaise. He was a key figure in the 1940s New York movement called Indian Space Painting, artists who based their abstract and semi-abstract work on Native American art; a striking movement which had a handful of practitioners (notably Steve Wheeler). In the 1950s he evolved into his form of Abstract Expressionism, which is more studied and less "spontaneous", creating formally pleasing paintings of well ordered shape and color. His later work returned entirely to figurative painting. He is probably best known for these enigmatic portraits of family, made from the 1970s onwards, notably the Silent Seasons series, which contrasts his earlier works edginess and brooding contemplation that becomes more remarkable when compared with the more placid and pretty works which followed his second marriage. Within his oeuvre one can chart the evolution of American painting trends of which Will was on the forefront, as well as the joys and vicissitudes of his personal life, with his first marriage ending in divorce and his second marriage providing a more stable family life, reflected in the harmonious compositions of domestic tranquility of his later work. 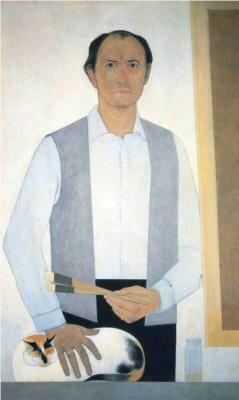 Artworks of Will Barnet are removed from WikiArt due to a copyright infringement notice.